2017 has been a fun filled year of traveling, discovering new promotions across the Midwest as we begin expanding our reach. While scrolling through Facebook one day, we came across a live video posted by Jerry Bostic promoting Sting coming to Oklahoma and so much more. As a wrestling fan, to see Sting was making an appearance close to home was amazing. Sitting in the crowd at Survivor Series 2014 was pretty cool, as Sting made his WWE debut. But the thought of being able to meet The Icon was even better. Throughout the busy schedule, I never brought it up to Oscar. Fast Forward a few months, Oscar and I had just gotten back to the hotel room from Wizard World Chicago and I pull up Facebook and once again this Jerry Bostic guy is on talking about Oklamania II/Oklacon featuring not only Sting but Lex Luger and so many more! Oscar and I talked about the event but never really thought we would make it to the event. We get home and a couple of days go by and Oscar sends me a text and mentions that he has been in contact with IWR management and that we should plan on heading to Ardmore, Oklahoma for this stacked super show. Long story short, we hopped in the car and drove 9 and a half hours to check out Imperial Wrestling Revolution. We had our expectations set pretty high for this trip and they blew them out of the water. Dustin, Jerry, and all of the IWR crew were so awesome to us. The day started with us showing up at the Hardy Murphy Coliseum, and getting set up at one of the tables. As we started getting our shirts ready, we were greeted by the IWR commentary team, Frankie V and Double T, Bump Monkey Mafia. Both Oscar and I had a great time meeting new people (Jeff Knight and the Chaser) and got some awesome interviews that have since been released. The biggest take away from this event was the amount of home grown talent that was there. With this super show, we saw Chavo Guerrero, Sting, Kevin Von Erich, Matt Sydal, and many stars. But the ones that stood out the most were guys like Fuego Del Sol, Chandler Hopkins, Ky-Ote, Cody Dickson, and we cannot forget The Magnificent Malico. The event itself was so much more than I could ever expected. The whole drive home, we could not stop thinking about how great the weekend was. IWR is something special, and we felt that. We scrolled past a IWR poster for their next event, "Souled Out 4 Life" featuring Kevin Nash, Eric Bischoff, Sean Waltman, and more. But we noticed former OTR guest, Karlee Perez was going to be there as well. It had been a few months since we brought Karlee to Saint Louis, and we thought it would be cool to see her again. So the next weekend, we hopped back into the car and headed to Weatherford, Oklahoma! Once again, IWR did not disappoint. So many great match ups and memories. Round 2 of IWR had us heading toward Weatherford, OK for Souled Out 4 Life. This was a particularly special show because of the circumstances. We arrive at the SWOSU Cellular Center and set up ringside to cover the nights events already we were excited for the match ups as some of IWR's rising stars were in big matches against names known globally. Chandler Hopkins and Cody Dickson took on the Steiner Brothers in a hard hitting match that ultimately had the two young upstarts losing but not without impressing the fans in attendance. Fuego Del Sol also excited the crowd in a triple threat match against Outlaw and Stevie Richards. The Bump Monkey Mafia were also in attendance as IWR's official commentary team, just like at Oklamania they were nothing but the upmost professional and kind people we've encountered at IWR. When Jerry Bostic and Dustin Jones say that IWR treats it's own like family they do not lie. The atmosphere of an IWR show is electric and they make sure to put on the best card possible. MVP versus Damon Windsor saw the rising star beat one of the worlds most respected in-ring competitor in MVP. 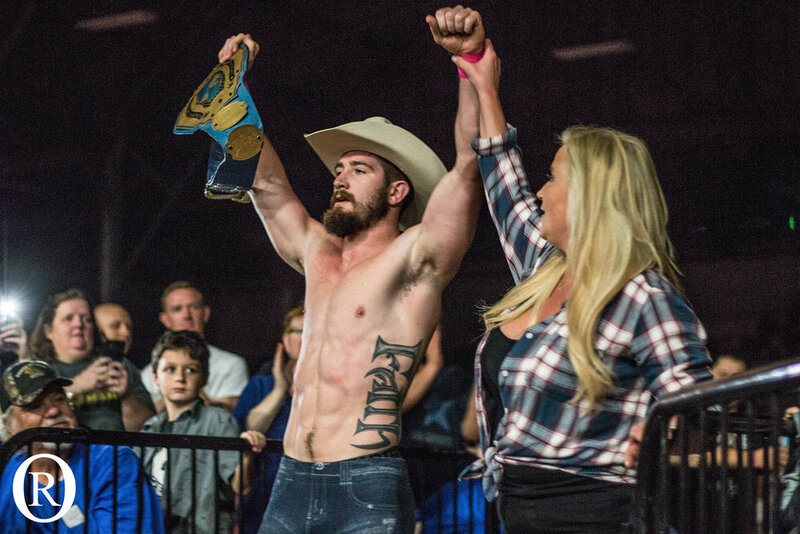 IWR not only puts on one of the best wrestling shows in Oklahoma but we can for see that IWR is going places and fast with some of the best crop of talent we've seen.